While siding damage is quite common in the midwest, it is usually isolated to a small section of your home's exterior. Whether you experience an errant rock from a lawn mower, pesky neighborhood (or household) animals, or a severe weather event that damaged your siding, My Handyman OnDemand can help. 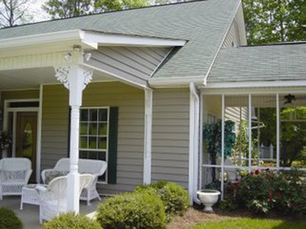 Many clients have come to us after receiving another contrator's recommendation or bid to replace all of the siding. While replacement may be the best option, and My Handyman OnDemand can help with this as well, many homeowners are more interested in repairing the siding, especially if they are happy with the look and believe the siding will last for many years to come. You can count on My Handyman OnDemand to explain all your options. We can do a full replacement or minor repair. It is up to you, our customer, and we will do whatever we can to meet your current needs. Click here to schedule to FREE estimate today!